He's been one of Tom Petty's Heartbreakers for 13 years, but Stan Lynch feels like he's just starting to hit his creative peak. Lynch, born in Ohio but raised from age 5 in Gainesville, co-wrote three songs on the new Don Henley album, "The End of the Innocence," released this week. He co-produced two of them, and played on sang on several more. For the 34-year-old Lynch, who drummed with several of Gainesville's seminal late '60s bands (the most popular was the power trio Road Turkey) before joining Petty and his crew in Los Angeles, the Henley experience was a true, and most welcome, collaboration. "It was more like being in a band than my band, especially for the last few years," he says. "My role is relegated to: I'm the drummer for Tom Petty & the Heartbreakers. That's what I do, and I'm not asked to do much more. "So I never really got out of first gear. This doesn't really bother me -- it'd be like the center bitching about why he doesn't get to run the ball. My job is to be the drummer." 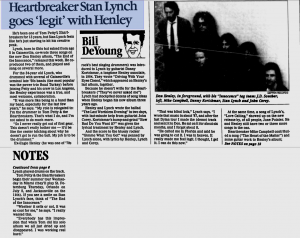 Ex-Eagle Henley (he was one of '70s rock's best singing drummers) was introduced to Lynch by guitarist Danny Kortchmar, a longtime Henley associate, in 1984. They wrote "Driving With Your Eyes Closed," which appeared on Henley's latest album, together. Because he doesn't write for the Heartbreakers ("They've never asked me") Lynch had stockpiled dozens of song ideas when Henley began his new album three years ago. Henley and Lynch wrote the ballad "The Last Worthless Evening" in two days, with last-minute help from guitarist John Corey. Kortchmar's bump-and-grind "How Bad Do You Want It?" was given the lyrical treatment by Henley and Lynch. And the score to the bluesy rocker "Gimme What You Got" was penned by Lynch alone, with lyrics by Henley, Lynch, and Corey. "That was blind luck," Lynch says. "I wrote that music in about '87, and after the last Dylan tour I made the (demo) track and sent it to Don. He sat on it for about six months, and I forgot about it. "He called me in Florida and said he was going to cut it. I was in heaven. It really made me feel legit. I thought, I get it. I can do this now." At the same time, a song of Lynch's, "Love Calling," showed up on the new release by, of all people, June Pointer. He and Henley still have two or three more songs in the can. Heartbreaker Mike Campbell contributed a song ("The Heart of the Matter") and some guitar work to Henley's album; Lynch played drums on the track. Tom Petty and the Heartbreakers begin their summer tour Wednesday in Miami (they'll play St. Petersburg Thursday, Orlando on July 8th, and Jacksonville on the 11th). If you see a smile on Stan Lynch's face, think of "The End of the Innocence." "Whether it sells or not, it was so cool for me," he says. "I really wanted this. "Everybody has this impression that when Tom did his solo album we all just dried up and disappeared. I was working real hard."